During the late nineteenth and the early twentieth century, Philip Bell Downing successfully filed at least five patents with the United States Patent Office. Among his most significant inventions were a street letter box (U.S. Patent numbers 462,092 and 462,093) and a mechanical device for operating street railway switches (U.S. Patent number 430,118). Downing also enjoyed a long career as a clerk with the Custom House in Boston, Massachusetts, retiring in 1927 after more than thirty years of service. Born in Providence, Rhode Island on March 22, 1857, Downing came from a prominent background. His father, George T. Downing, was a well-known abolitionist and business owner, while his mother, Serena L. deGrasse, had family roots in New York City, New York dating back to the mid-1600s. Philip Downing’s grandfather, Thomas Downing, had been born to emancipated parents in Virginia. He also had success in business, establishing Downing’s Oyster House in the financial district of Manhattan in 1825. It quickly became one of the city’s best-known dining and catering establishments. In addition, Thomas Downing played an important role in founding the United Anti-Slavery Society of the City of New York in the mid-1830s. One of six children, Philip Downing spent his childhood in Providence and Newport, Rhode Island, as well as in Washington, D.C., where his father was manager of the U.S. House of Representatives’ dining room. Census records indicate that Downing moved to Boston around 1880. Shortly thereafter, he married Evangeline Howard, and had two children, Antonia Downing and Philip Downing, Jr.
On June 17, 1890, the U.S. Patent Office approved Downing’s application for “new and useful Improvements in Street-Railway Switches.” His invention allowed the switches to be opened or closed by using a brass arm located next to the brake handle on the platform of the car. It also allowed the switches to be changed automatically in some cases. A little over a year later, on October 27, 1891, his two patents for a street letter box also gained approval. Downing’s design resembled the mailboxes that are now ubiquitous, a tall metal box with a secure, hinged door to drop letters. Until this point, those wishing to send mail usually had to travel to the post office. Downing’s invention would instead allow for drop off near one’s home and easy pick-up by a letter carrier. His idea for the hinged opening prevented rain or snow from entering the box and damaging the mail. 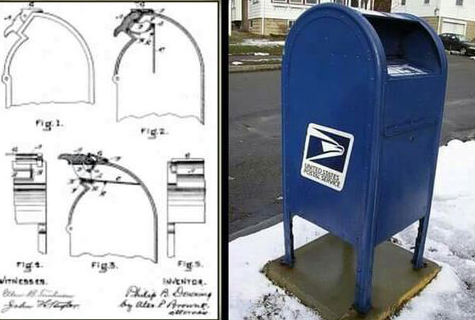 More than twenty-five years later, on January 26, 1917, Downing would receive another patent (U.S. Patent number 1243,595), for an envelope moistener, which utilized a roller and a small, attached water tank, to quickly moisten envelopes. The following year saw another successful application (U.S. Patent number 126,9584) for an easily accessible desktop notepad. Philip Downing died in Boston on June 8, 1934. He was 77. Misty Brown, "Ever Wonder," Afro-American February 6, 1988; Eyvaine Walker, Keeping a Family Legacy Alive: Unforgotten African Americans (Atlanta, GA: Twins Pub, 2011), 316 - 317. “Philip Downing, Boston, Retires After 31 Years Service in Custom House,” The New York Age, April 9, 1927.